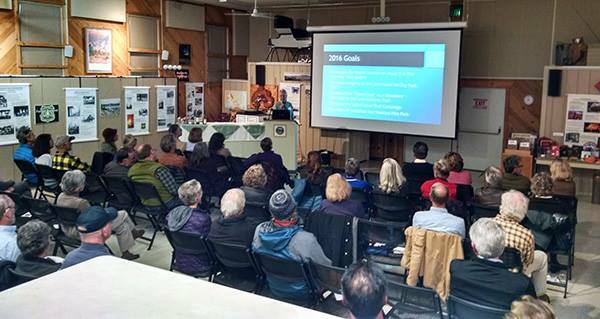 For those of you that were unable to attend the Trail Association’s Annual Meeting last week, here’s a recap of what was presented. The event was also captured on video by the Siskiyou Media Council, so watch for announcements on how to view the video. Addition of the Pig Farm and McConnell trails to the Gateway Trail system. Development of interim trails and creek crossing to facilitate the Downtown to City Park Greenway. Improvement of the Spring Hill Trail parking area and trailhead. An Earth Day work event at Castle Crags State Park. Repair and replacement of bridges and bridge railings at Castle Crags SP. Maintenance of the trail from Bunny Flat to Horse Camp. Construction of Garden Greenway trails at the Siskiyou Land Trust headquarters. Establishment of the 100 Miles of Trail Special fund with the Shasta Regional Community Foundation. A successful Giving Tuesday that generated $5,600. Establishment of a MSTA Facebook page. Construction of the Chalet Trail along the shoreline of Lake Siskiyou. Completion of the Shastice Bike Park. Further improvement of the Downtown to City Park Trail, including fuels reduction work. Locate and begin environmental analysis of a Gateway to Ski Park trail network. Continuation of the 100 Miles of Trail Campaign. Continue to work with partners, including the Forest Service, State Parks, BikeShasta, Siskiyou Land Trust, Rotary, Great Shasta Rail Trail Association, and Siskiyou County.